A constellation is simply defined as a recognisable group of conspicuous stars that are placed together as imaginary patterns or outlines on the celestial sphere. They are usually typified or embodies human-made constructions and often represent animals, mythological people or gods, mythological creatures, or manufactured devices. A true origin for the earliest constellations likely dates back to prehistory, whose unknown creators collectively used them to relate important stories of either their beliefs, experiences, creation, or mythology. As such, different cultures and countries often adopted their own set of constellations outlines, some that persisted into the early 20th century. Adoption of many constellations has significantly changed throughout the centuries. Many have varied in size or shape, while some becoming popular then dropping into obscurity, or others being traditionally used only by various cultures or single nations. In the northern hemisphere, the Western-traditional constellations were the forty-eight Greek classical patterns, as stated in both Aratus work known as the Phenomena or Ptolemy's Almagest — though their true existence probably predates these constellation names by several centuries. Newer constellations in the far southern sky were added much later during 15th and mid-18th century, when European explorers began travelling to the southern hemisphere. Twelve important constellations are assigned to the zodiac, where the Sun, Moon, and planets all follow the ecliptic. The origins of the zodiac probably date back into prehistory, whose astrological divisions became prominent around 400BCE within Babylonian or Chaldean astronomy. Based on the important astronomical need to formally define the placement of all celestial objects in the entire sky, the International Astronomical Union (IAU) ratified and recognized the 88 modern constellations in 1928. Therefore, any given point in a celestial coordinate system can now be unambiguously assigned to any modern constellation. Furthermore, many astronomical naming systems give the constellation where a given celestial object is found along with a designation in order to convey an approximate idea of its location in the sky. e.g. The Flamsteed designation for bright stars consists of a number and the genitive form of the constellation name. The term constellation may also refer to the stars within or across the boundaries of constellations. Notable groupings of stars that do not form the modern constellations are usually called asterisms. e.g. The Pleiades, The Hyades, False Cross, or Venus' Mirror in the constellation of Orion. The word "constellation" seems to come from the Late Latin term cōnstellātiō, which can be translated as "set of stars", and came into use in English during the 14th century. The Ancient Greek word for constellation was "ἄστρον". A more modern astronomical sense of the term "constellation" is simply as a recognizable pattern of stars whose appearance is associated with mythological characters or creatures, or earthbound animals, or objects. It may also specifically denote the officially recognized 88 named constellations used today. The term circumpolar constellation is used for any constellation that, from a particular latitude on Earth, never sets below the horizon. From the North Pole or South Pole, all constellations south or north of the celestial equator are circumpolar constellations. Depending on the definition, equatorial constellations may include those that lie entirely between declinations 45° north and 45° south, or those that pass through the declination range of the ecliptic or zodiac ranging between 23½° north, the celestial equator, and 23½° south. Although stars in constellations appear near each other in the sky, they usually lie at a variety of distances away from the observer. Since stars also travel along their own orbits through the Milky Way, the constellation outlines change slowly over time. After tens to hundreds of thousands of years, their familiar outlines gradually become unrecognisable. Astronomers can predict the past or future constellation outlines by measuring their individual stars common proper motions or cpm. by accurate astrometry and their radial velocities by astronomical spectroscopy. The earliest direct antecedent evidence for the constellations comes from inscribed stones and clay writing tablets dug up in Mesopotamia (within modern Iraq) dating back to 3000 BC. It seems that the bulk of the Mesopotamian constellations were created within a relatively short interval from around 1300 to 1000 BC. These groupings appeared later in many of the classical Greek constellations. The Babylonians were the first to recognize that astronomical phenomena are periodic and apply mathematics to their predictions. 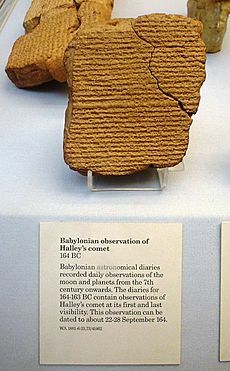 The oldest Babylonian star catalogs of stars and constellations date back to the beginning in the Middle Bronze Age from around 1000 BC. However, the numerous Sumerian names in these catalogs suggest that they built on older, but otherwise unattested, Sumerian traditions of the Early Bronze Age. The classical Zodiac is a product of a revision of the Old Babylonian system in later Neo-Babylonian astronomy 6th century BC. Knowledge of the Neo-Babylonian zodiac is also reflected in the Hebrew Bible. E. W. Bullinger interpreted the creatures appearing in the books of Ezekiel (and thence in Revelation) as the middle signs of the four quarters of the Zodiac, with the Lion as Leo, the Bull as Taurus, the Man representing Aquarius and the Eagle standing in for Scorpio. In ancient China astronomy has had a long tradition in accurately observing celestial phenomena. Star names later categorized in the twenty-eight mansions have been found on oracle bones unearthed at Anyang, dating back to the middle Shang Dynasty. These Chinese constellations are one of the most important and also the most ancient structures in the Chinese sky, attested from the 5th century BC. Parallels to the earliest Babylonian (Sumerian) star catalogs suggest that the ancient Chinese system did not arise independently. Historically, the constellations can be simply divided into two regions; namely the northern and southern sky, whose origins are distinctly different. The northern skies have constellations that have mostly survived since Antiquity, whose common names are based on Classical Greek legends or those whose true origins have now been lost. Evidence of these constellations have survived in the form of star charts, whose oldest representation appears on the statue known as the Farnese Atlas, which has been suggested to be based on the star catalogue of the Greek astronomer, Hipparchus. Southern hemisphere constellations are more modern inventions, which were created as new constellations, or become substitutes for some ancient constellation. e.g. Argo Navis. Some southern constellations were to become obsolete or had extended names that became foreshortened to more usable forms e.g. Musca Australis became simply Musca. Since the invention of the optical telescope, astronomers have found the need to catalogue and position celestial bodies, whose knowledge could be used for navigational or astronomical purposes, and this required improved definitions of the constellations and their boundaries. 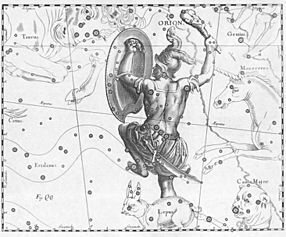 Such changes also assigned stars within each constellation, as first accomplished in 1603 by Johann Bayer in the star atlas "Uranometria" using the twenty-four letters of the Greek alphabet. Subsequent star atlases defined under celestial cartography lead to the development towards today's accepted modern constellations. Much of the sky near the South Celestial Pole below the declination of about –65° was not observed from the north hemisphere and became only partially cataloged by the ancient Babylonians, Egyptian, Greeks, Chinese, and Persian astronomers. 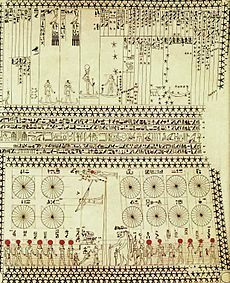 Knowledge that stars in the southern skies were different go back into Antiquity, being mostly gained from later Classical writers about Phoenician sailors : like the African circumnavigation expedition commissioned by Egyptian Pharaoh Necho II in c. 600 BC or those of Hanno the Navigator in c. 500BC. However, most of the knowledge of these ancient origins were likely irrecoverably and forever lost with the Destruction of the Library of Alexandria. Many of the 88 IAU-recognized constellations in this region were to be adopted from in the late 16th century by Petrus Plancius and were mainly based on the observations of the Dutch navigators Pieter Dirkszoon Keyser and Frederick de Houtman who had added fifteen by the end of the sixteenth century. Another ten were added by Petrus Plancius including: Apus, Chamaeleon, Columba, Dorado, Grus, Hydrus, Indus, Musca, Pavo, Phoenix, Triangulum Australe, Tucana, and Volans. 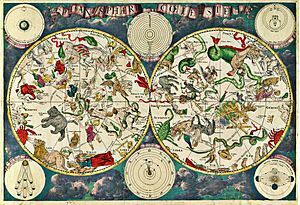 However, most of these early constellations only formally appeared a century after their creation, when they were later depicted by German Johann Bayer in his star atlas Uranometria of 1603. Seventeen more were created in 1763 by the French astronomer Nicolas Louis de Lacaille appearing in his star catalogue, published in 1756. In 1922, Henry Norris Russell aided the IAU (International Astronomical Union) in dividing the celestial sphere into 88 official constellations; Prior to this, Ptolemy's list of 48 constellations with many additions made by European astronomers had prevailed. However, these divisions did not have clear borders between them. 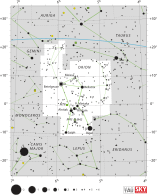 It was only in 1930 that Eugene Delporte, the Belgian astronomer created an authoritative map demarcating the areas of sky under different constellations. Where possible, these modern constellations usually share the names of their Graeco-Roman predecessors, such as Orion, Leo or Scorpius. The aim of this system is area-mapping, i.e. the division of the celestial sphere into contiguous fields. Out of the 88 modern constellations, 36 lie predominantly in the northern sky, and the other 52 predominantly in the southern. Constellation Facts for Kids. Kiddle Encyclopedia.